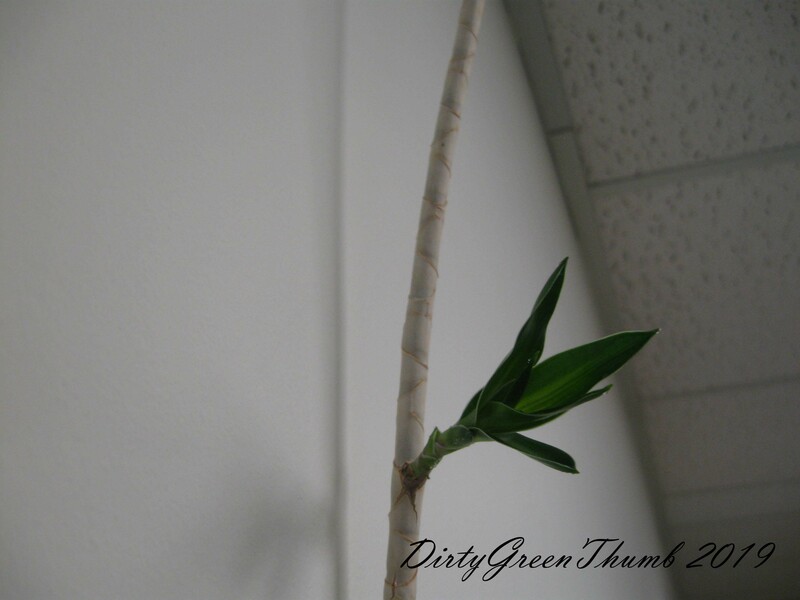 DirtyGreenThumb | Experimenting, learning, experiencing, growing! I was given my first amaryllis by my garden friend sometime in 2016. The bloom was so stunning that I bought two in the weeks leading up to Christmas 2017. They are such showy plants that I decided to give a few as gifts last Christmas. The recipients loved them! When I explained that the bulb would bloom next year, they were eager to learn how to make this happen. Here’s a simple explanation. I have bulbs with white, dark red (“wine”) and pink blooms. My favorite is the pink. The richness and warmth of the large blooms make me happy! I gave my dad a pink one and my mom a white one. You can’t go wrong, really. Which do you prefer, wine or pink? I tend to look for plants with two flower stalks (why get one when you can get two?) to get more blooms. 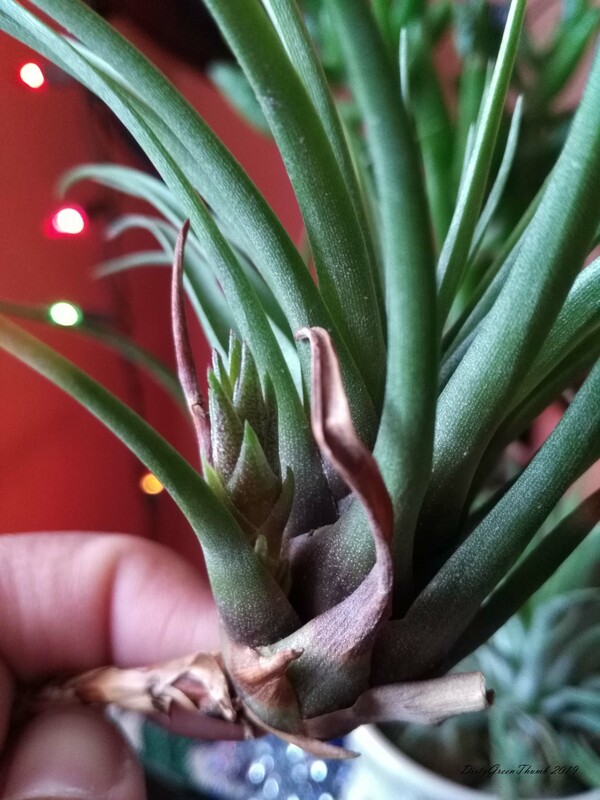 This one has two flower stalks. Each stalk has 4 blooms! 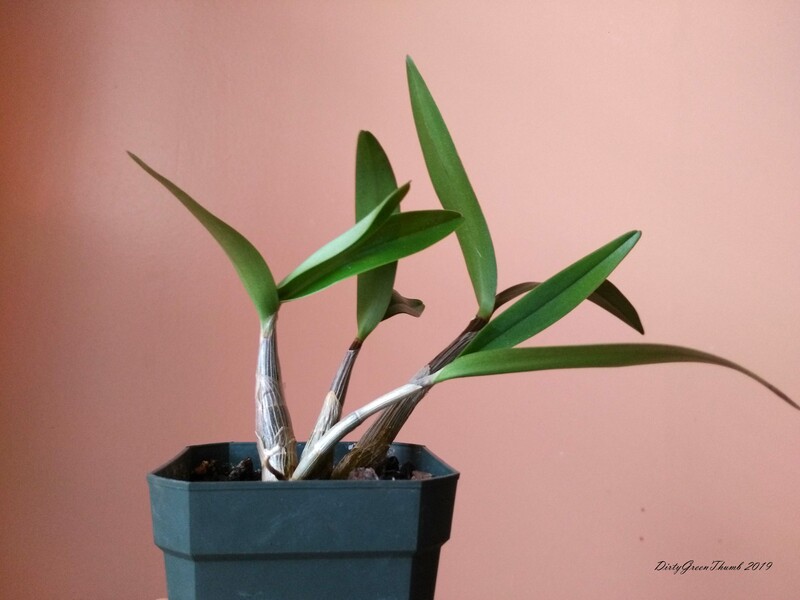 Although more bang for your buck, I’ve found that multiple blooms are too heavy for their stalk so they tend to fall over, regardless of if they are kept in their plastic pots or planted in another pot. No biggie, just cut off the flowers and enjoy them in a vase. 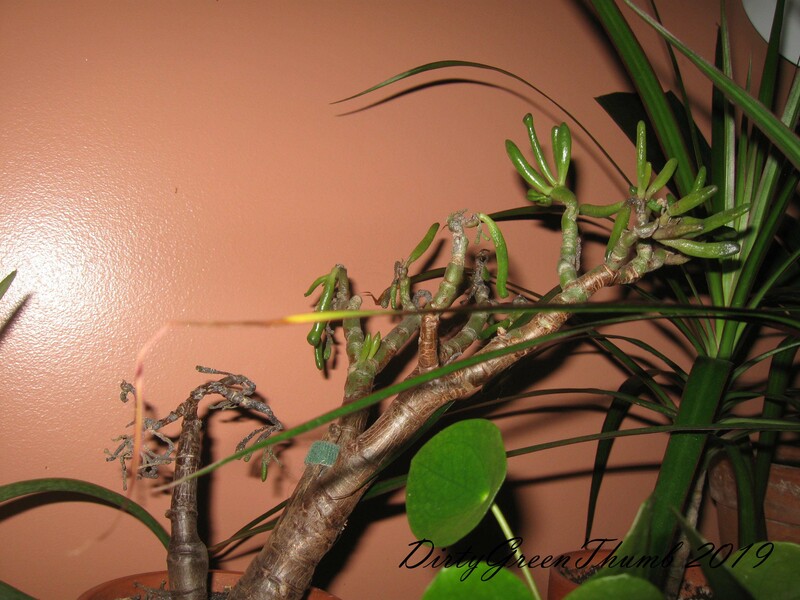 Once you separate the flower stalk from the plant, the leaves will grow to full size and you can enjoy it as a house plant. Still enjoyable without any blooms! 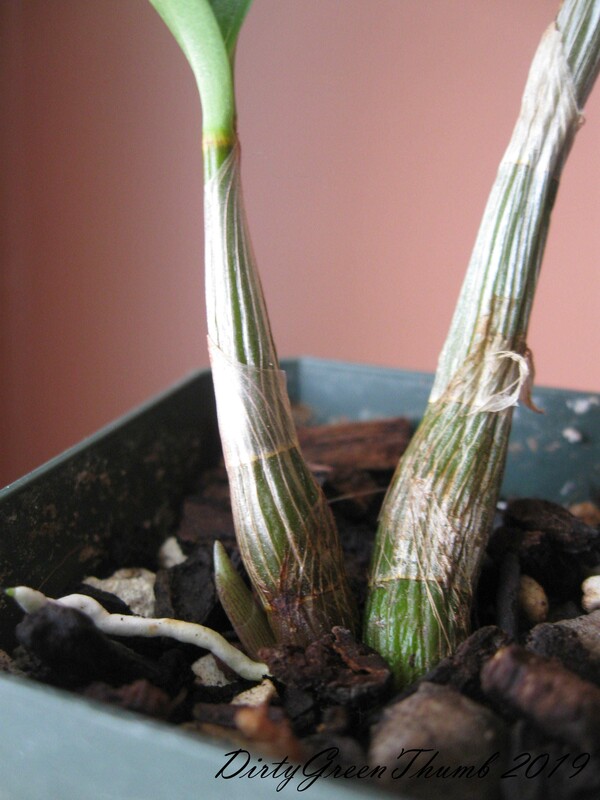 Cut off the leaves as they fade and when they are all gone, store the bulb in a cool dry place. It can be stored in its plastic pot or separately. 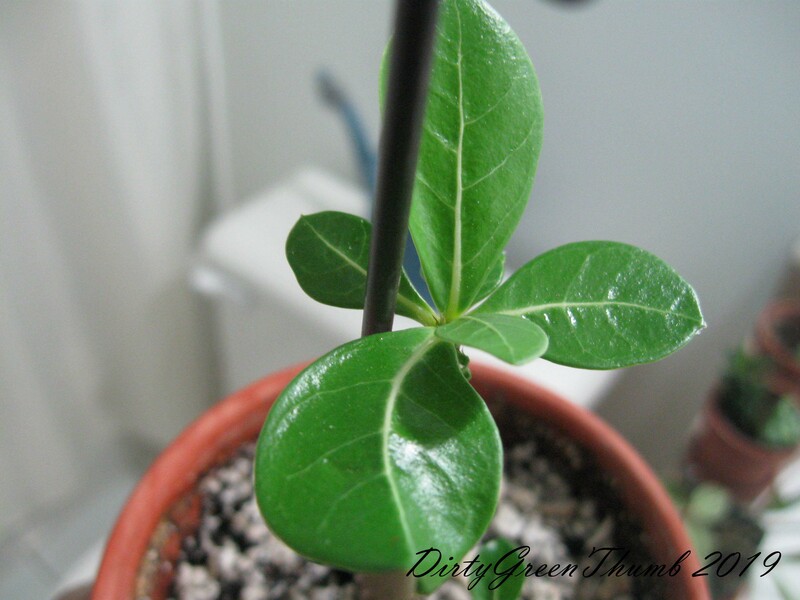 I like to remove them from the soil when it comes from the store and add the bulb to fresh soil when I replant it. I usually do. I’m a fan of “water deeply until the water drains out the bottom” of the pot, but “the bottom” of the poinsettia is usually covered in that red wrapping paper that makes it look so festive. So I end up over-watering and all the leaves drop off. In the past that meant trash time. No big loss, I used to think, I’m not really a fan of the plant. 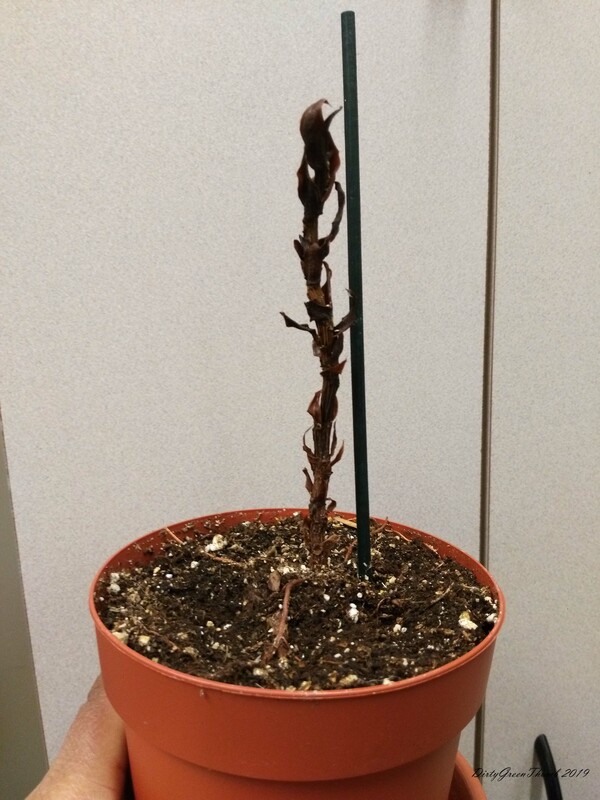 Last summer I noticed that a colleague of mine still had her poinsettia (and wondered why, in God’s name, before proceeding to forget about it). It caught my attention again recently; I have to admit it’s looking pretty impressive! 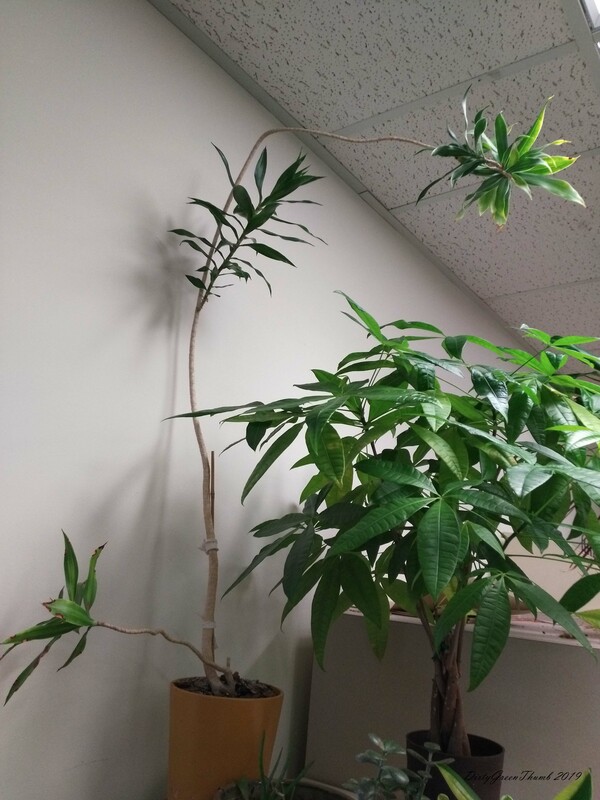 It turns out another colleague had been caring for both of these plants through a bought of white flies. 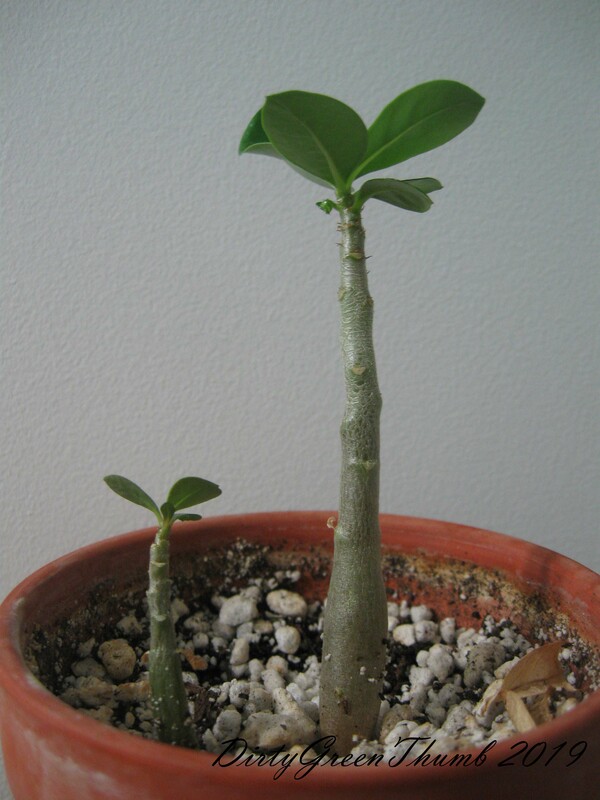 The one in the foreground had the worst case, requiring all the leaves to be removed. Now the leaves a growing back! 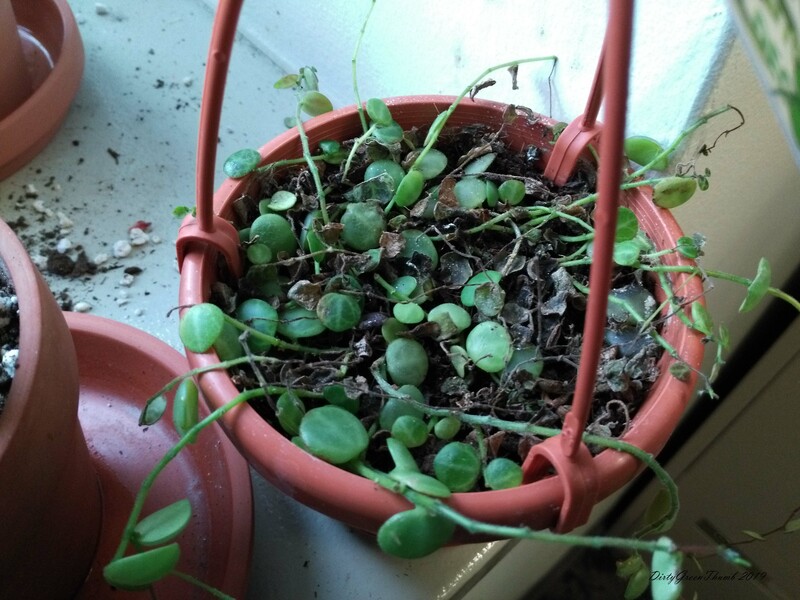 So I thought I would try to keep the one my mom bought alive, as an experiment. 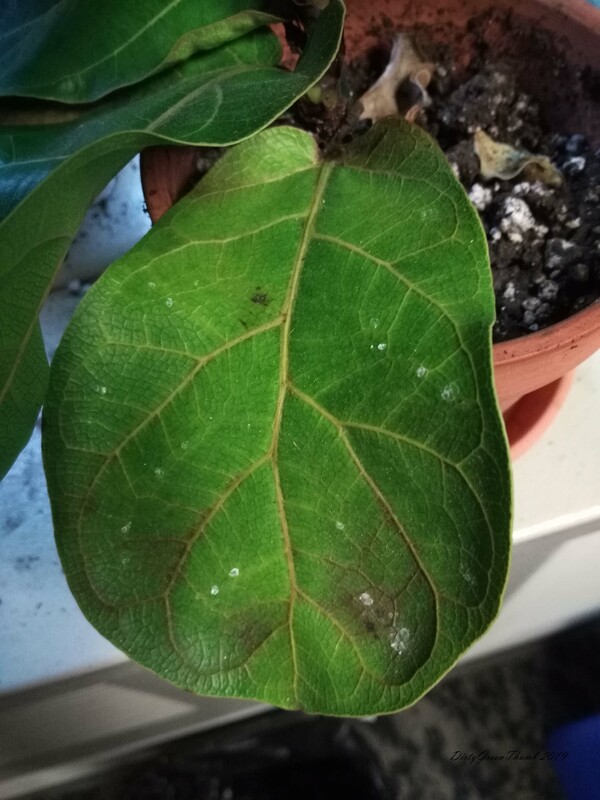 I’m happy to see that it’s started to make new leaves too! I’ve made room for it on my plant table so it can get as much light as possible during the winter. Pretty small now but it’s still progress! I’m not big on shopping, but last year I had two mad spending sprees: decorative boxes at Michaels (they rope you in by offering a 40% off coupon every time you buy something) and plants for under $5 at Canadian Tire. I picked up most of the plants from the Eaton Centre location, just south of Tiny Flower, during my lunch hour strolls. I really like the contrasting white and green of the dumb cane leaves. I bought quite a few plants (possibly 4 but I can’t remember). 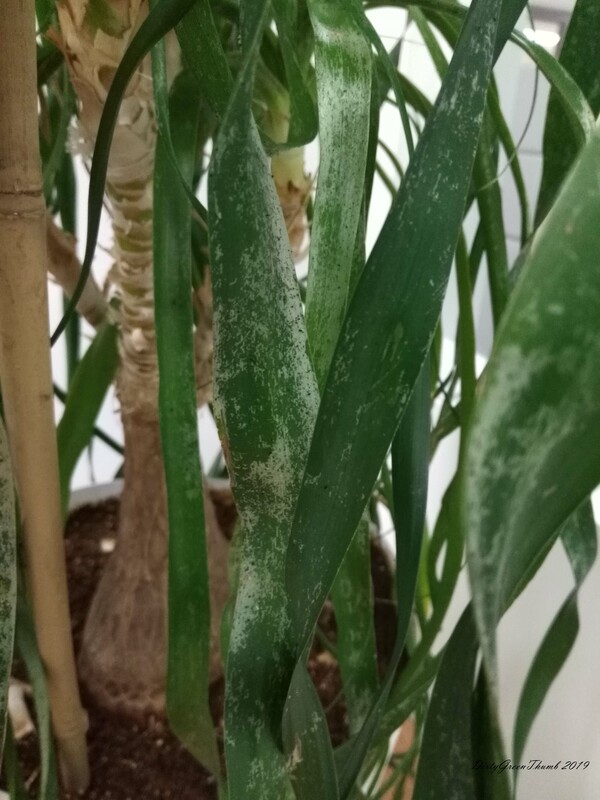 One survived, only to be attacked by thrips at the same time that I was dealing with them on the ponytail palm. You can see the clear little bugs crawling near the damaged parts of the leaf. The black dots are probably frass (poo). Thankfully, the dumb cane had a better outcome. 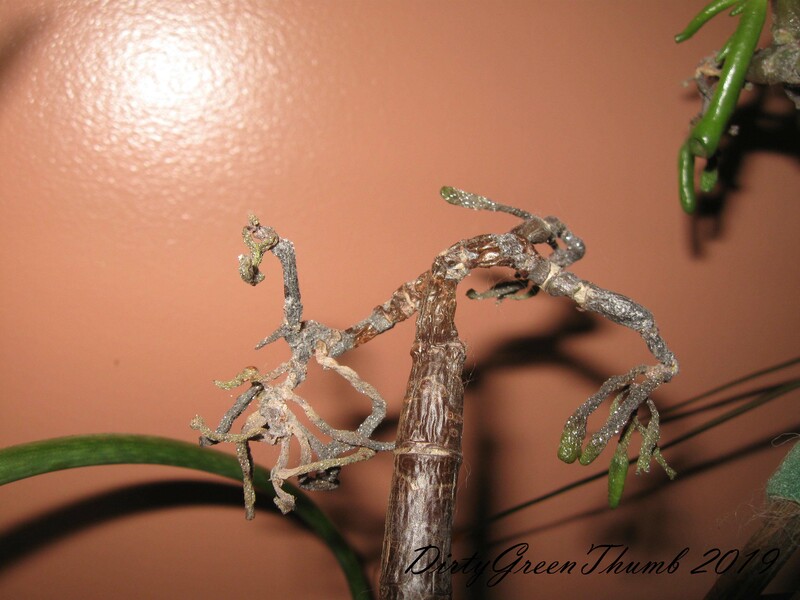 Spraying repeatedly with soapy water killed the thrips and made the plants leaves darker. Hopefully this brush with such a damaging pest has made the plant stronger and more resistant to future attacks. I liked the shape of this mammillaria pilcayensis or bristle brush cactus. This one was labelled ferocactus wislizeni. I found it at the Yonge and Church street location with two closed up blooms. I thought that if I managed to get it home without the blooms dropping off, it would have more of a chance of opening than under the dim lights of the store. The spikes on this plant are deadly! 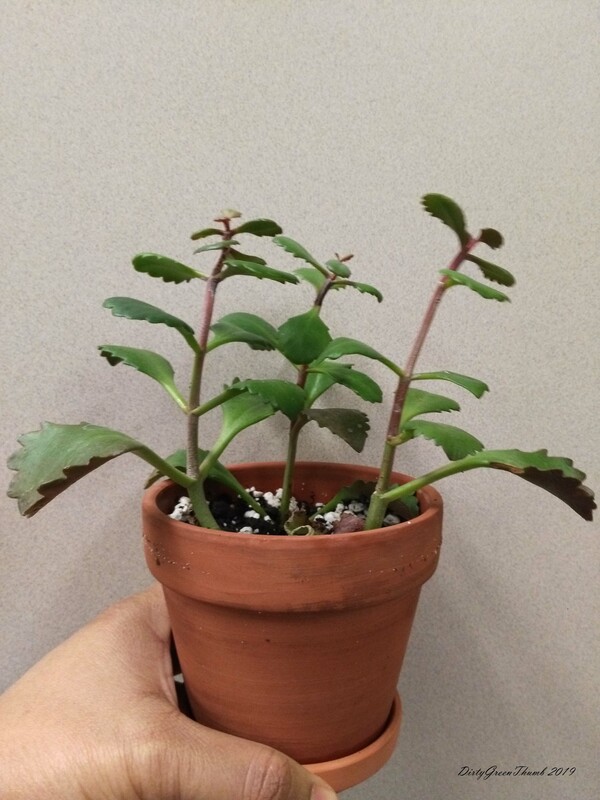 I was attracted to the thick leaves and red tinge of this kalanchoe longiflora coccinea. Wish I’d looked closer at this chalkstick plant before I bought it. 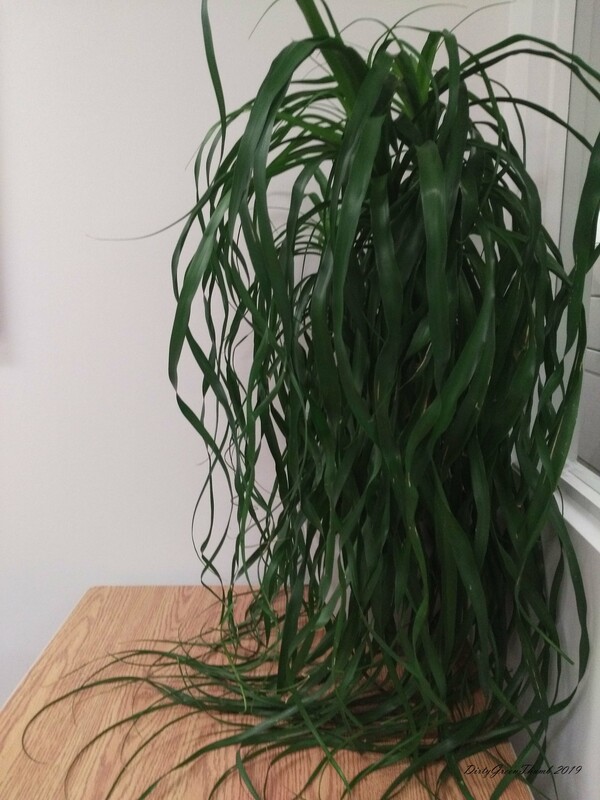 And I really wish I hadn’t passed on this ponytail palm (I didn’t know the cost, but I assume it was more than $5), especially in light of what happened to my other one. Will keep my eyes open for more this coming spring. I had two garden plots in 2018. 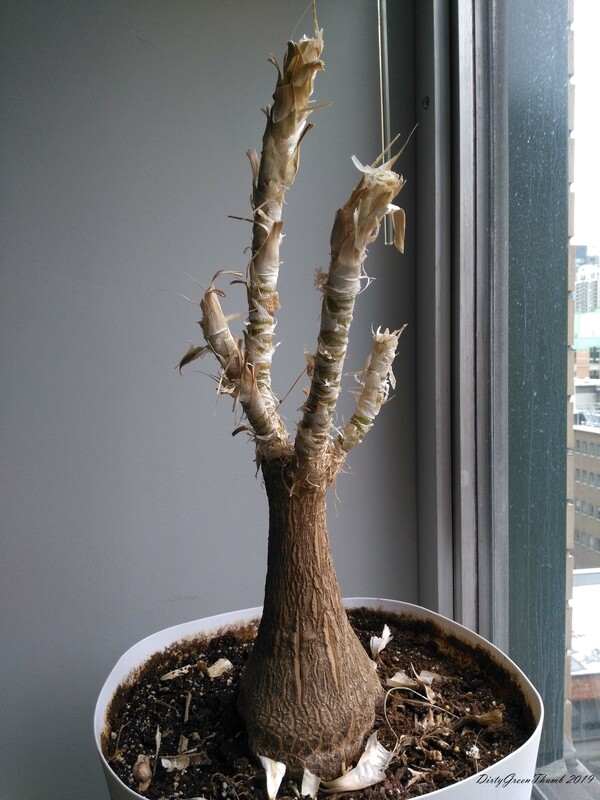 A friend wanted to grow with me but backed out just before the start of the season. In the new smaller plot, I did mostly herbs (basil, dill, parsley), peppers, nasturtium, and flowers. In the larger plot, I did the same along onions, garlic, a small strawberry bush my garden friend gave me, the lavender bush I planted in 2017 (I think), and the dill and calendula that self-seed every year. I wanted a break (and to give the soil a break) from the more demanding fruit-bearing plants and to see what it would be like to just grow flowers, herbs and salad greens like a few of my fellow community gardeners. I didn’t miss dealing with tomato plants, but I did miss having zucchini. In the end, I think I prefer having a combination of vegetables, herbs and flowers. The heat and humidity (feeling like 40 degrees) during the summer really helped the peppers to do well. I don’t usually buy convenience store plants, opting instead for heirloom and organic plants from Urban Harvest, but my friend shared some hot pepper plants she bought on the Danforth and they did well! I think these are Thai chili peppers. They were really hot! My rosemary has never grown as large as it did last year. It was so beautiful! Roasted some with a whole chicken (yum!). It was practically the length of my forearm. I took it inside in hopes of keeping it alive over the winter. My garden friend offered me some extra giant zinnias so I agreed to take them. They did great, blooming well into the fall. This was taken in October! Green leafy veggies didn’t do very well last year, probably because of the extra heat and humidity (and I probably didn’t water enough). I planted kale, collard greens and a few salad mixes. Nasturtiums didn’t do well either. I also planted some corner store leeks from my friend that didn’t make it to adulthood (they like cooler temperatures and I planted them late). As for thefts inherent in having a public garden space, some of my onions got taken as well as heads of flowers that had gone to seed. Although I saw swallowtail caterpillar eggs for the first time in 2018 and I saw many caterpillars in the first instar, I didn’t see them progress beyond that stage. Although I have other flowers that attract butterflies (cornflower, zinnia, and the asters that I saved from the community garden in 2017), I decided butterfly milkweed might be a nice addition to the flower garden. Although I don’t remember seeing butterflies swarming around them, I would grow them again (I harvested lots of seeds). The blooms are really pretty. While looking for formation on how to propagate bear paws, I came across an interesting comment on Succulents and Sunshine site. Under the ‘From readers like you’ section at the bottom of the post, Margaret D. was using a no-mist, no sitting-on-soil method that had never failed to work for her. This peaked my interest. 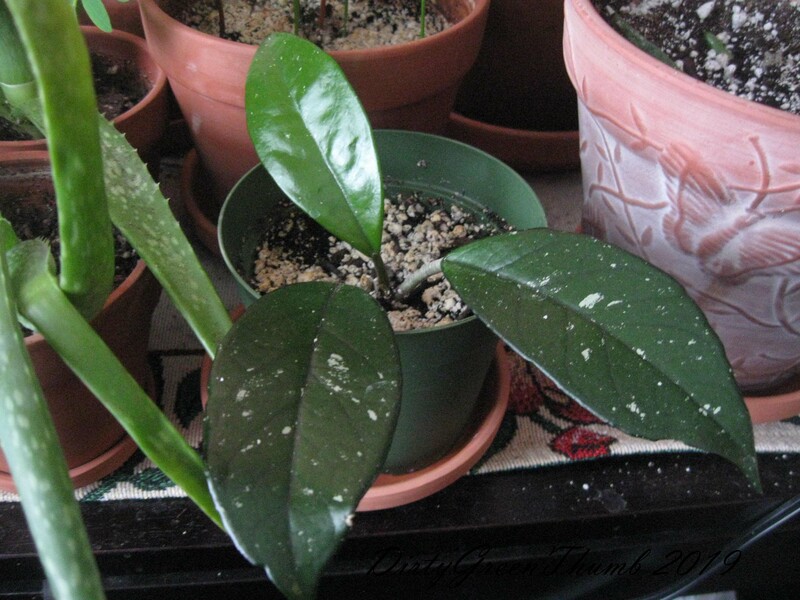 I’ve tried laying bear paw leaves on soil and misting but they would just shrivel up and die. 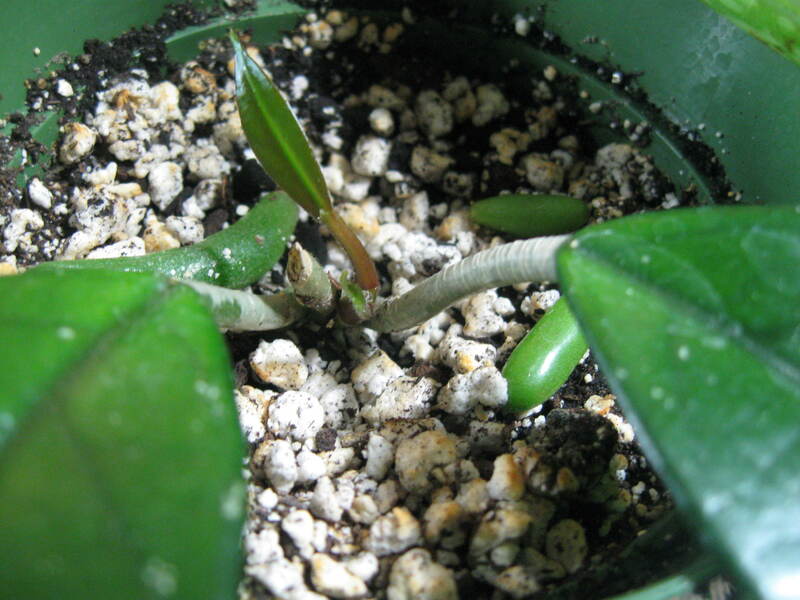 Some leaves tolerate this method better than others. All of the bear paws died with misting. The cacti remained intact. I couple of leaves recently came off my plant at home so I’m going to try the no-soil, no-mist method. We’ll see how it goes. 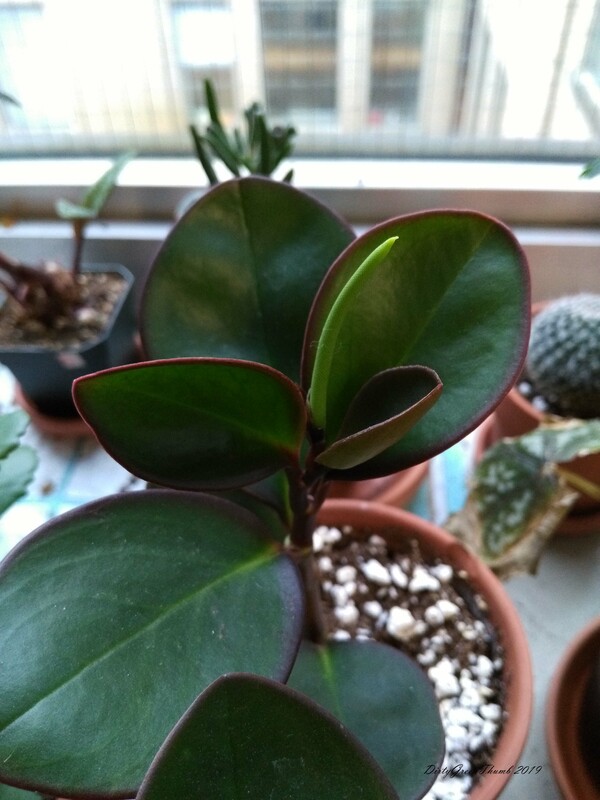 My bear paw is a bit droopy and some of the leaves have fallen off after gently brushing by them. I’m really afraid of over-watering them so I water every 2 weeks. Hopefully these little guys will get enough light now that the tree is the front yard has lost its leaves. They are on the mantel of the electric fireplace. Fingers crossed! The houseplants did pretty well this year. 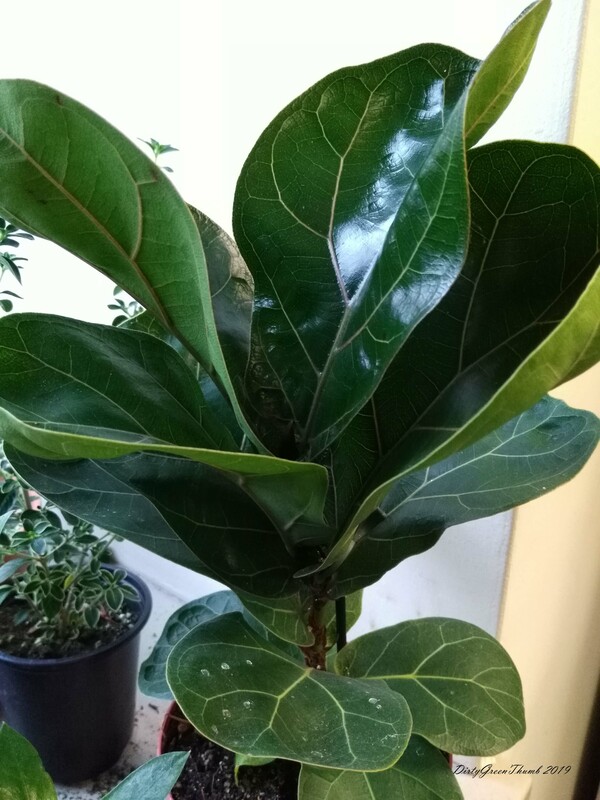 I did lose my beloved rubber tree but a friend at work returned the one I had given her (she was not a fan). I brought home some new plants, including a dieffenbachia, 2 dracaena, and succulents (I got a bear paw! 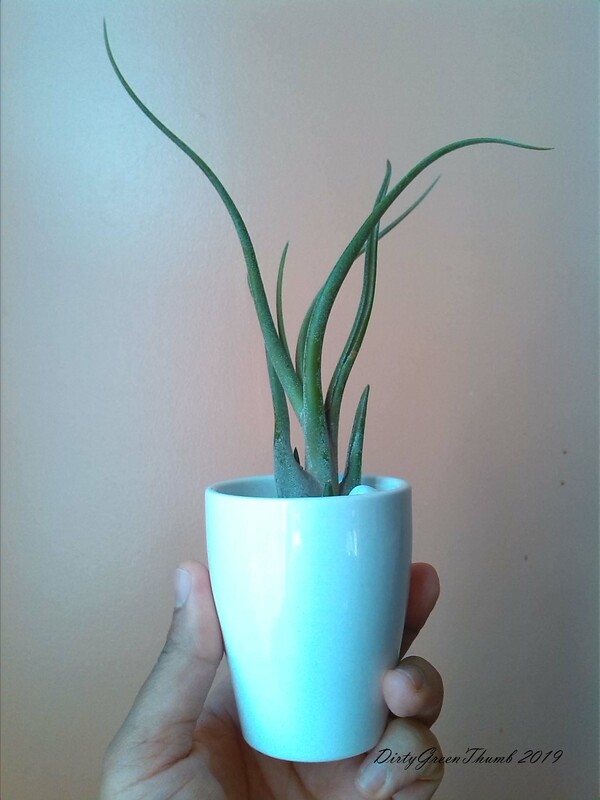 ), and I put a snake plant in my room after reading it releases oxygen at night and improves air quality. They are all cozy on my plant table, enjoying the bright light in my living room now that the tree in my front lawn has lost it’s leaves. My garden friend gave me this Dendrobium Kingianum, a lithophytic orchid from Australia, in May of 2017. 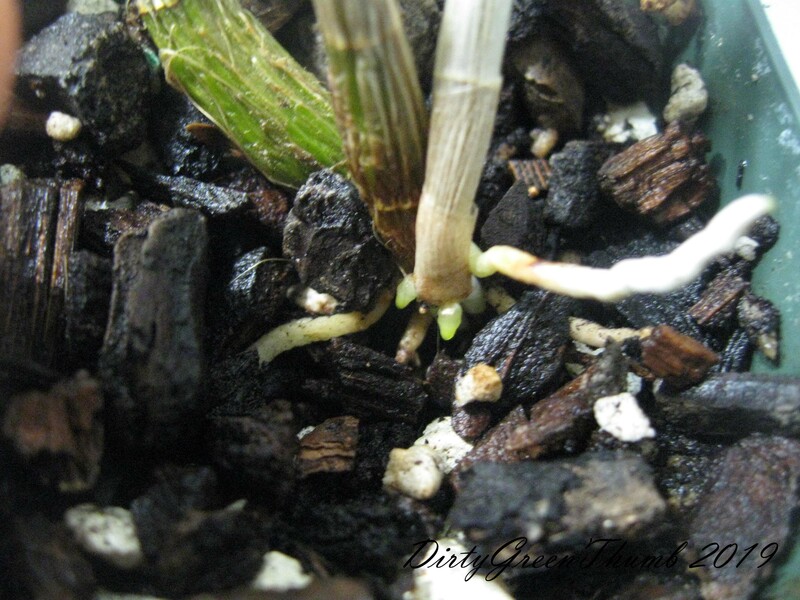 Last year it grew 2 new branches and several new roots! 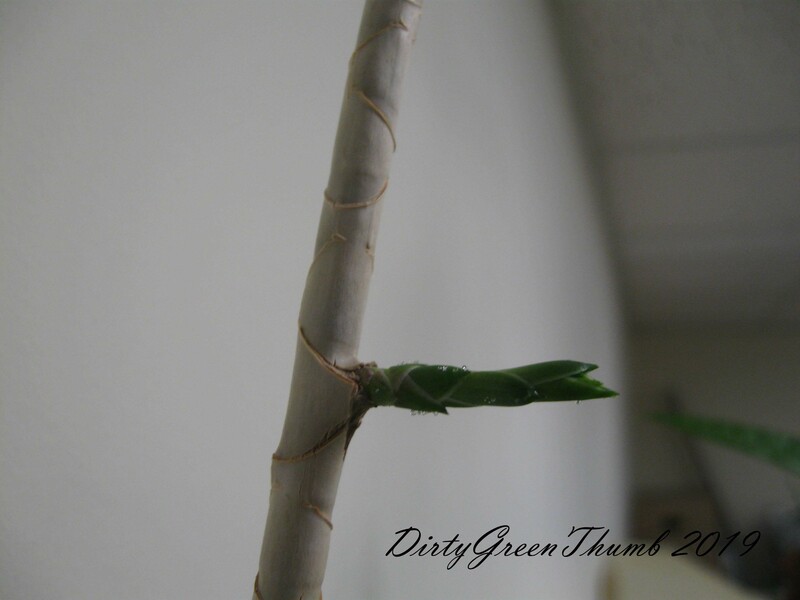 A new branch and air root (white)! No flowers yet but I hope it’s just a matter of time. 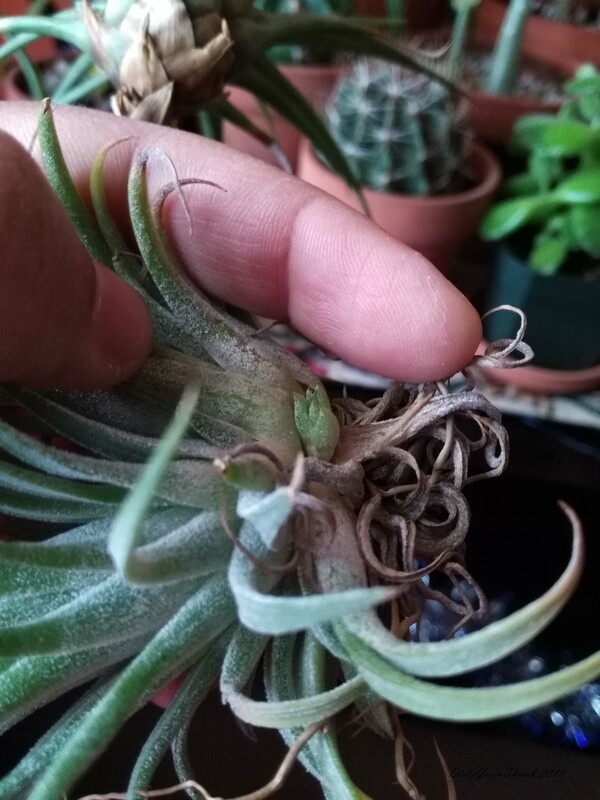 The first air plant I ever bought made a pup. 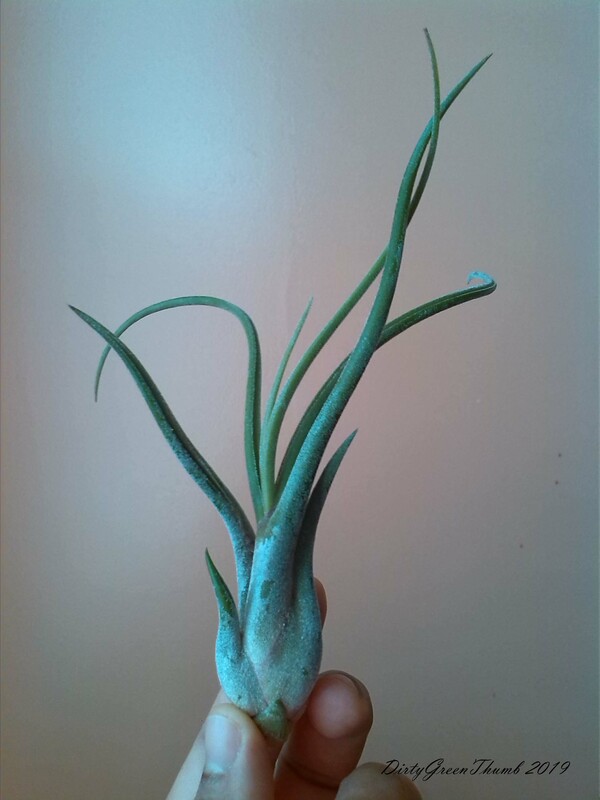 A year later, it grew up (awww!). The baby is now bigger than the mama. Hope it blooms this year! 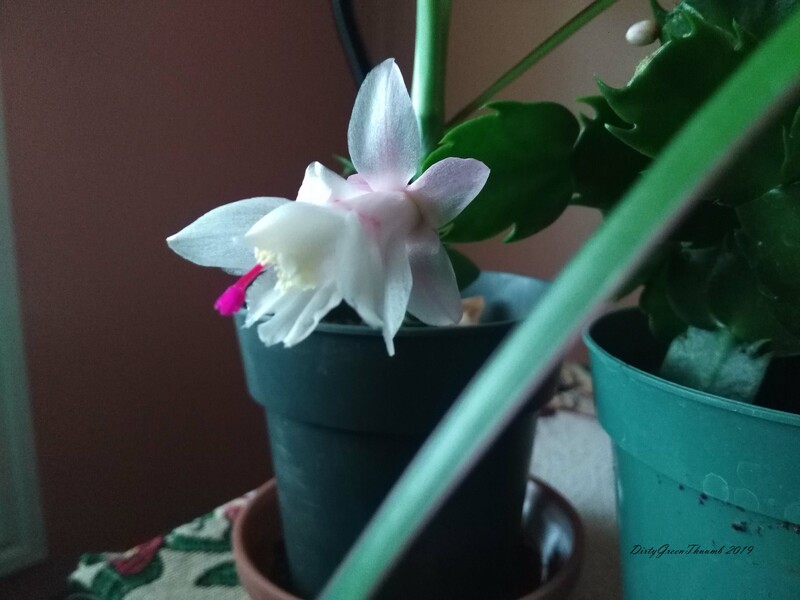 The second plant I bought bloomed in December 2017. The bloom didn’t get any bigger or fancier than this. And now it has a baby! 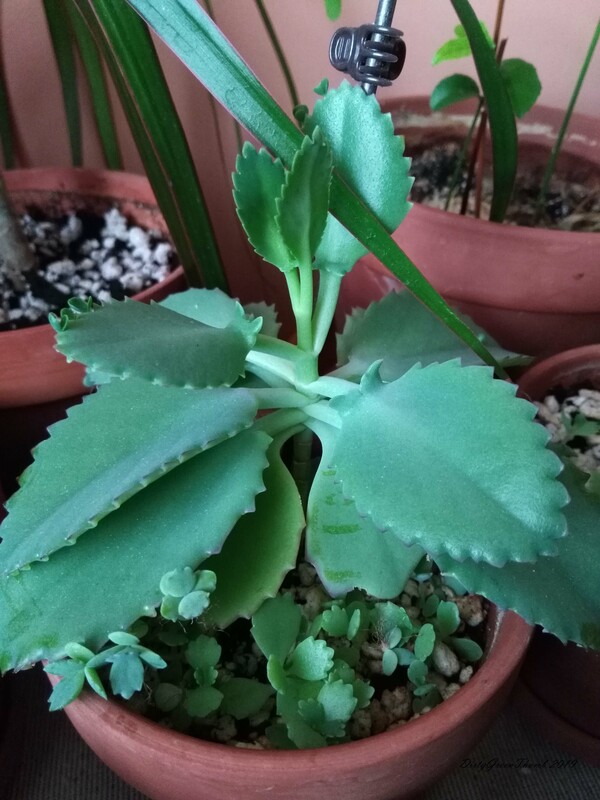 This mother of thousands is being true to her name. Would you like to receive this gift that keeps on giving or would it be a cruel joke? At times it feels like a bit of a burden having to deal with all of the babies, but it’s hard not to be impressed when all the leaves are covered with little ones. I guess that’s why it’s a high, not a low. For now. 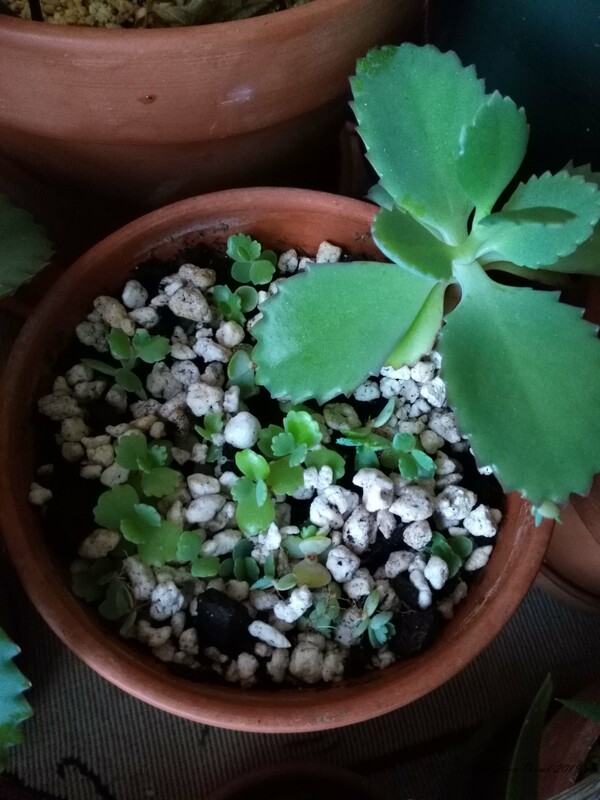 I bought these seeds in 2017 on Amazon.ca from somewhere in Germany, if I remember correctly. I was excited when they began growing, but since then the ones I gave away last year have died and the ones I kept are barely growing. I’m still hopeful they will improve but definitely disappointed in their progress. We had a heatwave during the first week of July, with temperatures feeling like 40 degrees Celsius and I had no air conditioning. The heat really took it’s toll (it was a bad time to take a week off, I could barely function). 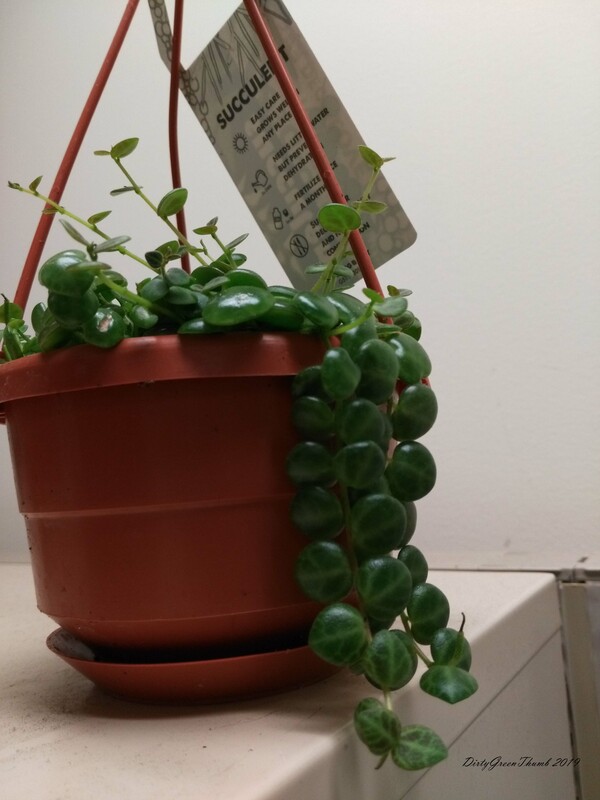 I lost several plants, including my gollum jade. I was so ill from the weather that I didn’t notice it shriveling up. 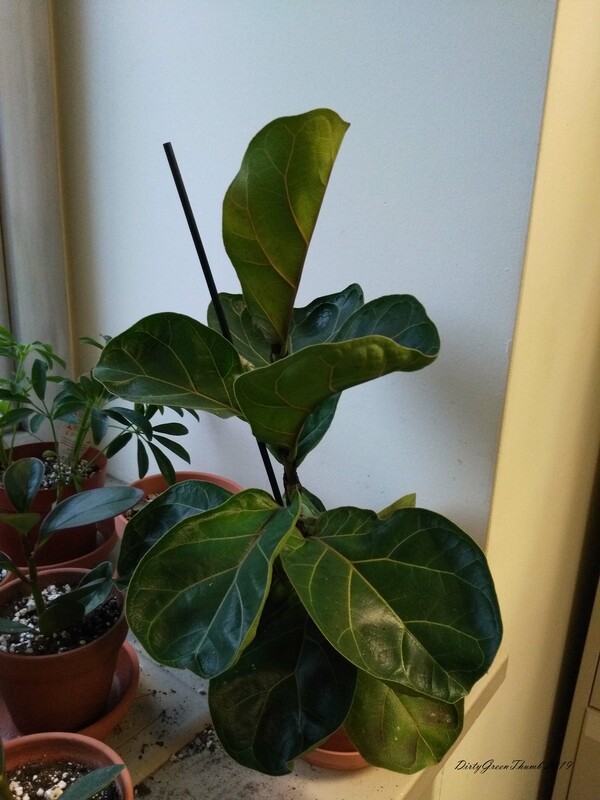 Shriveled leaves and branches and a soft, squishy stem. Just horrible! Perhaps I didn’t water it enough during all the humidity. Or over-watered? Thankfully I got another one from my garden friend. Not full grown and glorious like the last one but it’s coming along. I was so sad to see this one go. 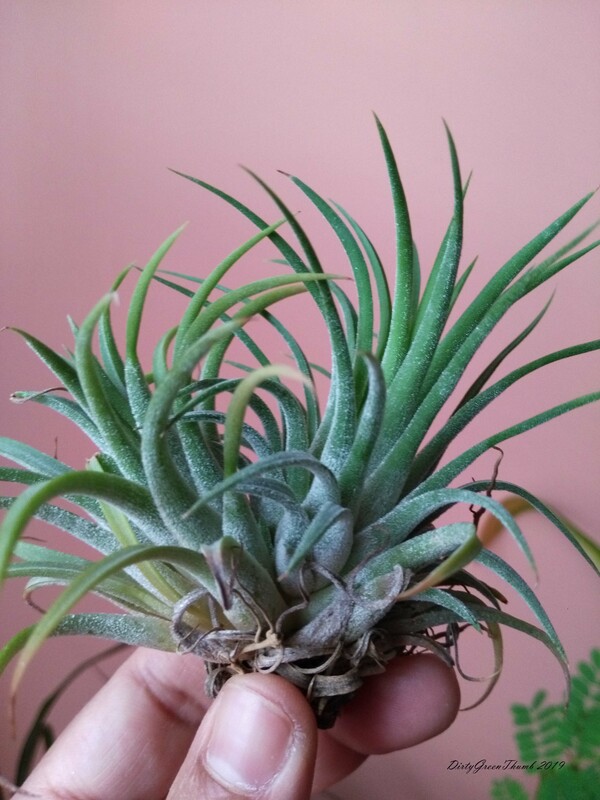 I bought these air plants at Tiny Flower on Bay street. I love how they look like they’re from outer space but I also think they look pretty classy in the pots that came with the mini orchids I bought at Metro (couldn’t get them to re-bloom and then they died). And just like that, we are well into 2019! Usually when I come back to work after the holidays, some plants have died off but this year every single one survived! Perhaps it’s because I took a shorter break. The year went by so quickly, I thought it would be fun to look back at some of the highs and lows of my plant adventures in 2018. First, the office. I snatched this baby up from the kitchen, on a table where people put things they dont want. I didn’t think much of it at first, but I’ve grown to love it! It was fun watching it grow a new branch over the past year. Until it became a giant branch! Amazing! I finally learned how to care for these guys: soak them about once a month for about 15 to 20 minutes. Squeeze the leaves and if they feel thick, they’re OK. If they feel thin, they need a soak. I kept the cactus I bought last year in the same container hoping it would bloom again but it didn’t, so I bought another one with buds. Only one bloomed, but what a beauty! I’ve bought these red tinged peperomia in the past but couldn’t keep them alive. This year I managed to keep them all alive (I have 3 or 4 plants). One even bloomed! 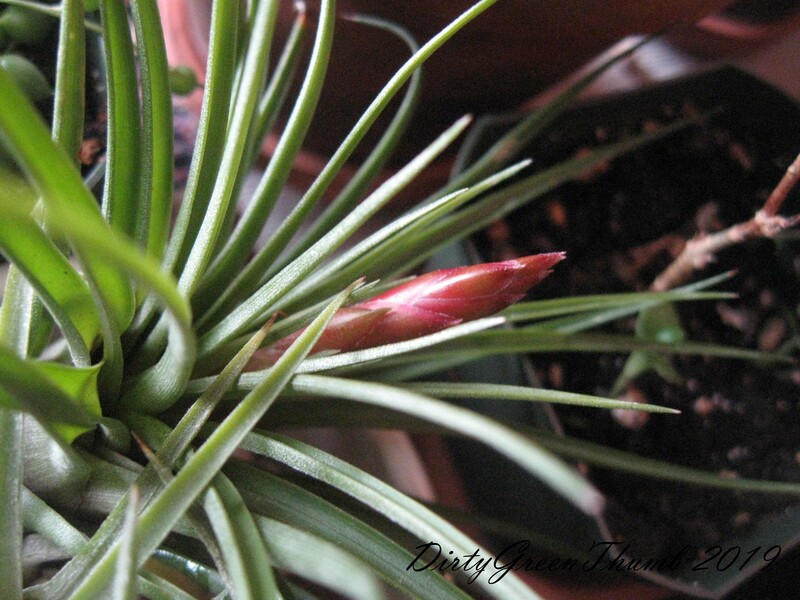 Yep, that little green finger pointing to the right is a bloom! This beautiful specimen came to me late last fall from a friend at work. Had to put it in the kitchen because my office had no space. Looks like a Muppet from Sesame Street. All she’s missing is googly eyes! Some weeks later, I noticed there were silver streaks and black spots all over the leaves. We moved it to an office window when someone agreed to take it. I thought the black spots were frass and then I discovered they were moving! A Facebook group confirmed I had thrips. Spraying the leaves with soapy water was helping but I got to it too late. Had to chop all the tops off, it was so infested that the leaves fell out when I tried to clean them off. I’m not sure if it will grow back. 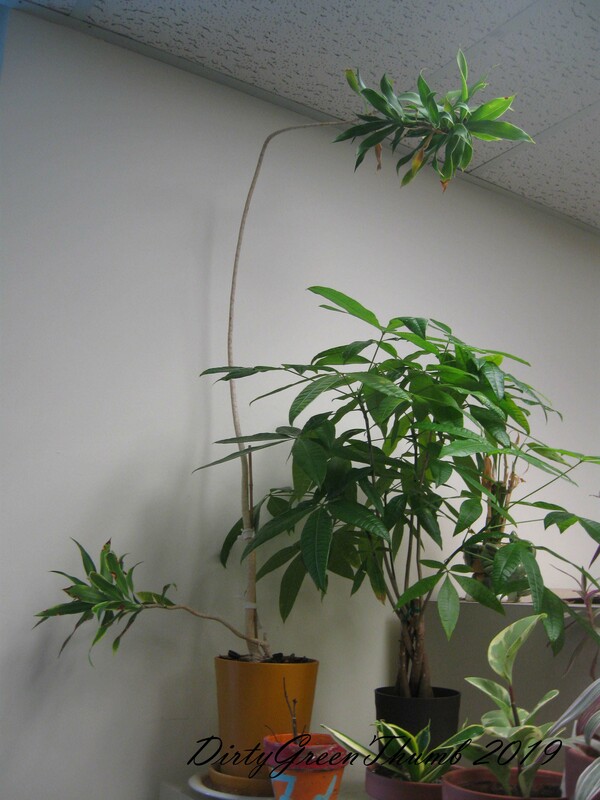 We think that the transition from a home with lots of natural light, watering and fertilizer to an office kitchen with little light and much less watering (once a month, especially with the winter coming around) may have been too much of a shock, leaving it vulnerable to pests. Absolutely failed to keep not one, but two of these guys alive. Such a costly shame. And then the leaves started bowing out. I would guess over-watering lead to the demise of both of the plants I bought but I can’t be sure. One was meant for a friend. Should’ve gotten it to her sooner. Look at how beautiful this was!!! I am ashamed to see the difference. Gutted! I absolutely love this plant! It’s so easy to care for. It’s even doing well at home where it gets much less light. 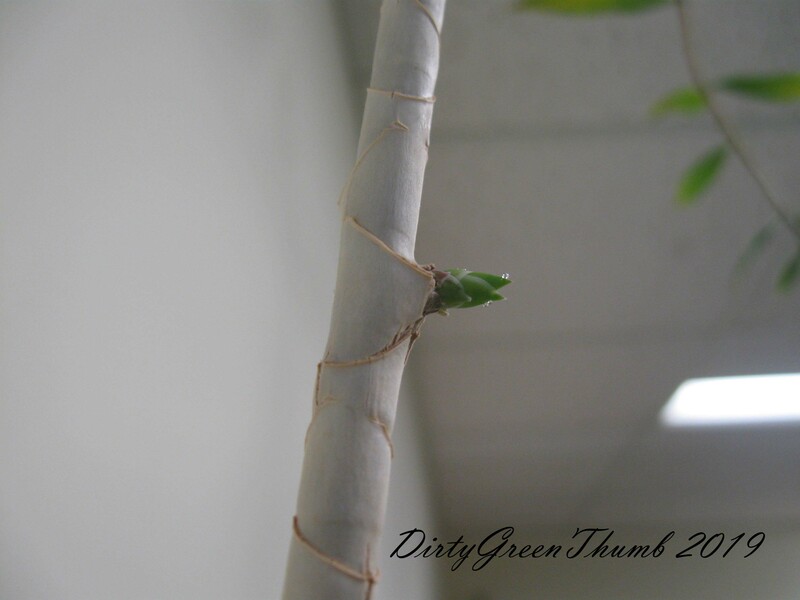 The smallest branch at the back is unfurling and there’s a new branch growing at the front!